Our agent, Carol Smith, went above and beyond our expectations to make sure our visit was an enjoyable one. Couldn't have asked for better. Our stay at Treasure Island was just what we needed; the location was excellent. The view from the balcony was awesome; beautiful sun sets every night. The weather was perfect during our entire stay. Would definitely stay here again. We had a wonderful time at Gulf Crest! The windows in the unit and the kitchen was wonderful. We had such a great family time. The bunk beds worked great, even for grown children. Thanks to Carol for being so great to work with! We have used JF Beach Rental for many years! Carol is always very helpful when booking our condo for vacation! We love Regency Towers and can't wait for the next family vacation! We have stayed at Regency Towers for many years. It is and will always be our favorite place. The location is perfect. The large pools and the easy access to the beach is just a few of the reasons we continue to return! Loved the unit. Very spacious and nicely updated. It was difficult to keep the front bedroom cool. Would also have enjoyed being able to see the sunset from the balcony. As stated before the blinds on sliding glass door needed work. The room was clean as could be with sand in it. But was a very good,first condo renting e experience. We will be staying again hopefully in same condo!! Carol was excellent to work with. The property was very clean and well maintained. The only thing I really saw was the shower curtain in the master bath was mildewed and needed to be changed. The TV's could be upgraded but that wouldn't keep me from renting the u it again. Very clean, up to date, well maintained. Ms. Carol was very friendly and helpful in making our reservations and making sure that we got all the check in and out information. The cleaning staff and maintenance staff were also very friendly and took care of the issues we had. 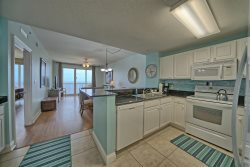 We had a great stay at Gulfcrest at PC Beach! Carol was professional, friendly, and easy to work with. We will definitely work with her in the future. We had an amazing week making memories that will last a lifetime. The place surpassed our expectations.